LOS ANGELES -- It's Disney Night on Season 27 of "Dancing With the Stars," and over the years fans have always loved these performances. 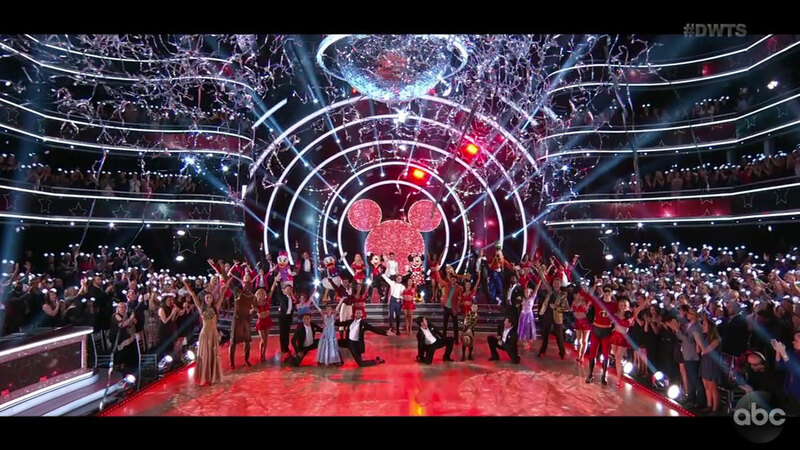 The professional dancers go all-out to choreograph and create magical moments to familiar Disney songs. Many of the couples made a trip to Disneyland and California Adventure during the week and while that may have cut into some rehearsal time, it looked like everyone was thrilled to take a quick break to visit the Happiest Place on Earth. J.P. admitted the perfect score he earned in week three got in his head a little bit. Last week's 8s brought him back to the real world. He was thrilled to see Disney Night because he's been a card-carrying Disney super fan since he was a kid. Juan Pablo actually wanted to be a Disney animator. He embraced the character of "Gaston" from "Beauty and the Beast" and Cheryl Burke did masterful choreography (again) for their Viennese Waltz. When the routine was over, host Tom Bergeron said it is one of his favorites in all 27 seasons. Head judge Len Goodman liked the gusto and zest of the dance. Bruno Tonioli thought J.P. nailed the character and both his style and the amount of content was spot on. Carrie Ann Inaba told Juan Pablo he had flair for days, as well as momentum and finesse. Alexis got her first 10s and highest score to date for a fluid, flowing Foxtrot to a tune from "Pocahontas." She blushed several times before and after the performance when producers/judges/Tom all hinted that Alexis and her pro partner Alan Bersten might be becoming a couple. Len called it a well-crafted routine with no stressing and messing about. Bruno thought the dance was lyrical, flowing and gorgeous. Carrie Ann said the routine made her believe in fairy tales and thinks this is Alexis' best dance of the season. Milo and Witney Carson channeled Mr. Incredible and Elasti-girl to perform a Quickstep to that film's soundtrack. No surprise he's a huge Disney fan - he got his show biz start on Disney Channel and the film "Zombies." Their trip to the amusement park included a ride on the Incredibles own roller coaster. Witney knew Milo could handle this dance because the 17-year-old has so much energy. Bruno agreed, calling the routine a blockbuster and gave them a 10. Carrie Ann was right behind with a 9 and thought the dance was full of life. Len agreed there was a lot of "zippity doo dah" to the dance but not enough body contact. DeMarcus is still nursing a dislocated finger but his real pain was in last week's scores. The pro athlete doesn't let a bad week get him down and used it to motivate him for learning the Charleston. Lindsay Arnold had lots of fun choreographing a very physical routine with her "Hercules." We've never seen lifts like this! And to top it off, Lindsay's shoe broke at the beginning of the dance but she soldiered on! Carrie Ann said DeMarcus's athleticism and grace shined through and this was a breakthrough routine. Len thought it felt like a Disney movie, which leaves you feeling great at the end. Bruno thought this was Ware's most complete performance to date. Mary Lou made a promise to herself this week: she was not going to be so hard on herself. Sasha Farber's Contemporary routine let her work through a few things. They danced to "Reflection" from "Mulan," and Mary Lou said the lyrics are spot on for her. She is feeling more confident and her self-esteem is rising. Retton broke down in tears after the routine and said it's been hard for her to show her vulnerability but she's getting there. Carrie Ann said she lives for these kind of "real" moments on the show. Len called the dance gentle, understated and fluid. Evanna said being in jeopardy last week freaked her out. She said it felt like she was teetering on the edge of a cliff. Keo convinced her to harness that fear and put it into their Jazz dance to the music from "Tangled." Speaking of fear, Keo's kryptonite is roller coasters. So of course, she took him on Big Thunder Railroad! Len softballed his review of their routine, calling it nice and well-danced, but not spectacular. John has been worried about the Quickstep since the beginning of the season. He's the oldest person in the competition and knows the Quickstep is, well, quick! He was pleased to have a song he's loved since childhood, "I Wanna Be Like You" from "The Jungle Book." Len thought Emma Slater's routine was full of energy and content. Bruno said it was a proper, recognizable Quickstep. And Carrie Ann said it was his best performance yet. Bobby was bummed about his scores last week, but said he loved the dance. He even got a good job tweet from MC Hammer after his routine. It's a 180 this week with the Waltz. Sharna Burgess told him he needs to be elegant and graceful. Both Sharna and Bobby were excited about their song: "Part of Your World" from "The Little Mermaid." Sharna considers herself to be Ariel in real life. The "Bachelor" favorite wanted to make the point that he is taking this competition seriously and he's working hard to learn his dances. Jenna Johnson told him she sees growth and challenged him with a fast Jive to a new song from the upcoming animated movie "Ralph Breaks the Internet." The judges gave words of encouragement as well, with Len saying every time Joe gets knocked down, he dusts himself off, comes back and gives it his all. Carrie Ann saw a vast improvement and Bruno sensed a faint glimmer of hope. At the end, Tom and Erin Andrews went through the motions of naming two couples "in jeopardy" but hey, it's Disney Night, we can't end on a bad note. So no one was sent home! Next week will see some Halloween fun!